The art (and stupidity) of taking 360 panoramas in PlayerUnknown's Battlegrounds. For a while now I've been playing PlayerUnknown's Battlegrounds (PUBG), it's a you vs 99 other players fighting to the death game, loosely based on previous games which themselves are loosely based on the Japanese film Battle Royale (and later The Hunger Games). 100 people are dropped onto an island, only one can survive, it most likely isn't you. 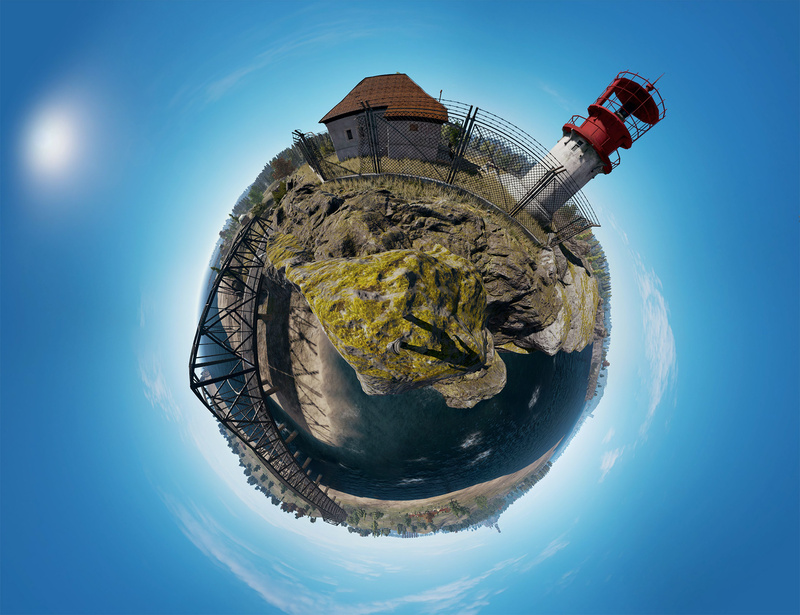 So of course I decided the correct way to play was to attempt to take 360 panoramas. 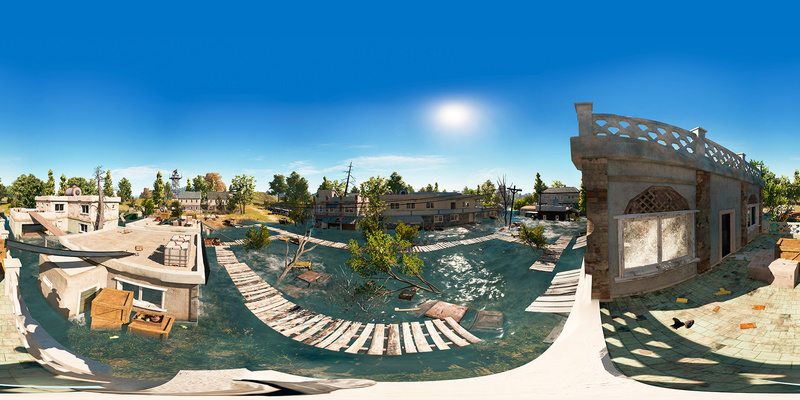 There are a couple of complications while taking 360 panoramas in PUBG. Firstly there's no built in ability to do so. Nvidia, has a software tool called Ansel as part of their GeForce range of cards, which when used with a compatible game allows you to not only take artistic in-game "photos" but also has a one button 360 panorama solution. You press the button and it spins you round in a very precise fashion stitching together all the shots as it goes. PUBG is not one of those compatible games. The second, and slightly more pressing issue, is that 99 other people are all running around attempting to kill you. You leap out of the plane at the start of the game and hurtle down to the ground as fast as possible, preferable aiming for somewhere that's going to have a nice view. Run as fast as you can to some high point. Stand on top of the high point, right out in the open, with a good clear view all around you, trying to get a nice clear line of sight everywhere. Turn off the UI then spinning around as quickly as possible while spamming the screenshot button, tilting further up and down after each full 360 turn. I then used Autopano 4 by Kolor the "best image stitching technology in the world" to stitch the images together. I have no idea if it really is the best in the world, but after trying several different software packages it was the only one that reliably created results that weren't weird abstract montages of sky and rock seemingly randomly thrown together. Everything else was terrible, Autopano by contrast just worked. At some point I'll probably use it for "real" photos, but for the moment I'm finding it far too entertaining creating game 360s to make backdrops for Facebook Spaces VR, because meeting your friends in VR in a tavern from World of Warcraft is fun and yes I am a big nerd, why do you ask? Anyway, back to PUBG, to start with I picked fairly deserted areas such as the top of Georgopol Hills (where there's no buildings and no loot and therefore unlikely to be other players) or the town of Zharki in the very top North West corner where nobody (with any sense) goes. Which gives you plenty of time to take the screenshots needed before the wall of blue death closes in on you and wipes you out. Ah, because I didn't mention this before, not only are there 99 other players out for your blood, but also an ever contracting circle of killer electricity slowly forcing all the players closer and closer to each other. Land, find weapons, (attempt to) kill off all the other players around you within shooting distance as fast as possible. Quickly take lots of screen shots. 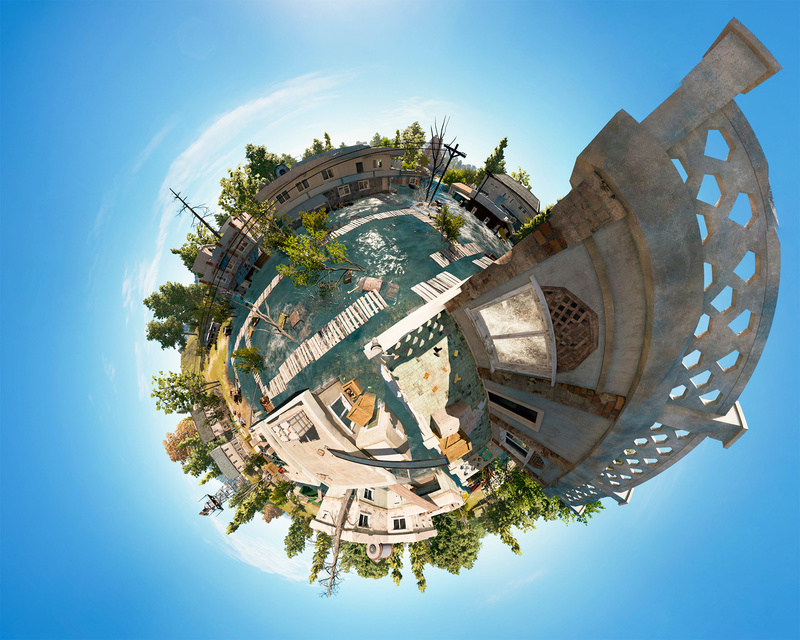 You can view the rest of my PUBG 360 panoramas over here on Kuula, and you totally should, I died many times trying to make them. Because trying to take calm scenic views in a dystopian death match with killer wall of blue electric death and various environmental hazards wasn't enough, and because I like Field Recording, I decided that making an hour long ambient in-game field recording was a good idea, because of course it is.